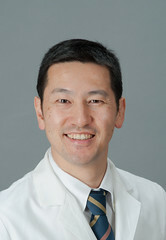 Post written by Tomonori Yano, MD, from the Department of Gastroenterology and Endoscopy, National Cancer Center Hospital East, Kashiwa, Japan. This study was a prospective evaluation of efficacy and safety of biodegradable stents for refractory benign esophageal strictures after curative treatment for esophageal cancer. Before conducting this study, little was known about the efficacy and safety of biodegradable stents for refractory strictures after ESD or radiation. Specifically, this study was the first prospective trial of biodegradable stents for refractory strictures including post-ESD cases. We continuously evaluated the dysphagia score and endoscopic findings once a month, and the endpoint was set at 3 or 6 months to assess short-term and long-term outcomes. The efficacy of biodegradable stents for refractory strictures was favorable 3 months after placement and did not differ from the etiologically of esophageal strictures. However, the long-term outcome at 6 months after placement was insufficient especially in cases after ESD or radiation. We also experienced a case of esophago-bronchial fistula at 3 months after stent placement for post-ESD and CRT cases. While this case was small, we should carefully treat with biodegradable stents especially for cases after CRT or ESD cases. Figure 2. 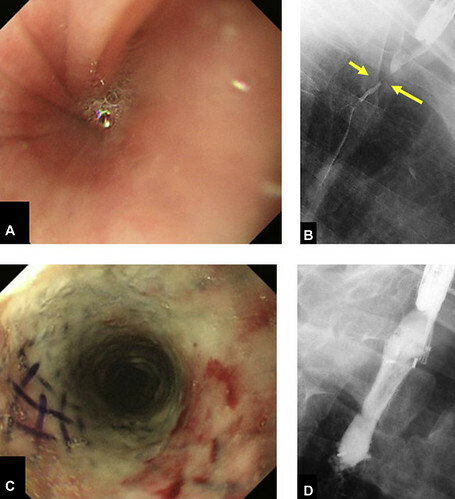 A patient with refractory esophageal stricture after endoscopic resection followed by chemoradiotherapy for esophageal cancer (case number 2 in Table 1 ). A, Endoscopic imaging of stricture before stent placement. The patient’s dysphagia score was 3 before stent placement. B, Fluoroscopic imaging of stricture before stent placement. The narrowest point was at the yellow arrow. C, Endoscopic image of stricture at 4 weeks after stent placement. Patient’s dysphagia score improved to 0 after placement. D, Fluoroscopic imaging of stricture after stent placement. Because of the small cases of the present study, further evaluation is necessary to clarify the safety and efficacy of biodegradable stents for refractory esophageal strictures.